Sarasota, Florida poses unique challenges to having good color. The quality of the water is not great, the sun is so fierce that it can fade even wood floors, the saltwater in the Gulf dries out hair, and swimming pools bleach out color. Therefore, you need a colorist who understands these challenges. The advantages of processing color with a hair steamer are: color deposits far more deeply – all the way to the root of the hair – the hair is far more saturated with color. My colors don’t fade. Rather than using harsh chemicals to lift and deposit color, the steam allows me to use a more gentle formulation. I used to use dry heat but a mild wet heat is far better than dry heat in that the hair doesn’t get dried out, it’s quiet and more comfortable for the client than dry heat, and finally Steam takes much less time to process – from 6 to 12 minutes. This technology along with my own unique color application technique (it does matter how color is applied and I do it differently than anyone else) along with rich in pigment imported color (no skimping on expense) make this the best color you’ve ever had. To add further depth and dimension – I include foils at no additional cost. Highlight and or lowlights can be subtle or bold – hair color should never be flat. I have no "hard to color" clients. With this process no gray or white hair is ever difficult. I guarantee 100% coverage. You can even cover gray with a lighter color. 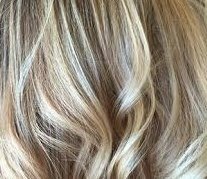 Many of my clients elect to go to a blonde shade so that their regrowth is not so obvious. In summation wet heat drives the color into your hair like no other technique; I predict that one day all stylists will be doing this. Update: I now offer Matrix Bond Ultim8 which I find to be superior to Olaplex. However if you have a preference for Olaplex, I still offer that as well. Even more value is added to the Steam Process; Essential Oils Aromatherapy is included at no additional cost. Choose between Calming Citrus, Eucalyptus, or Lavender. Or no scent at all. The Steam provides an excellent facial. Which Brand of Color Does Ian Use? I use many different brands of color depending on the clients hair. Often I receive calls and am asked this question. The client asking this question does so because she has had either a good or bad experience with a certain color line and thinks it’s all about the brand. She’s wrong. It’s all about the colorist knowing how to formulate color. I’ve seen colorists who don’t know how to properly formulate get terrible results with excellent color and I’ve seen knowledgable colorist get amazing results with inexpensive color I would never touch. Ian uses a variety of brands including Aloxxi Chroma, Tressa, Wella, Pravana, and Redken - just to name a few. Every clients hair is different and the integrity of the hair - the health- must be respected and maintained. Ian has no brand loyalty, only loyalty to his clients. No, my color does not fade any more than natural hair color. The Steam processing drives it in so deep without damaging the cuticle, all the way into the root. That said, clients often come in with severely damaged hair from which any color will fade. To understand this better please read my blog on "Healthy Hair - The Cuticle." Also every once in a while a client calls and says, “My color faded.” Upon examination it always turns out that she’s referring to her regrowth. I can’t stop your hair from growing. If you have very white roots they may show in as little as three weeks. Most of my color clients come in every 4 to 6 weeks.